Title link takes you to the full review on CDM. "Literally what TENORI-ON means in Japanese is "sound in your palm" but what I came away feeling after hearing Toshio Iwai’s story and later experiencing this innovative musical device for myself at Yamaha’s UK Launch event last Tuesday was more akin to the Richard-Dreyfuss-Close-Encounters quote. Never mind that the light-and-audio-synched performances can bring back visions of that film’s alien jam session. * I may not be articulate enough to explain fully why or how I was so affected by my short time with this snazzy gadget (my logical working-musician-self keeps on telling me that, measured by today’s music hardware standards, this is still just mashed potatoes, albeit in a very cool shape) but I do consider myself self-aware enough to appreciate the very real visceral impact it had on me. I’ve a sense the TENORI-ON is important, but not in a way most of us can fully appreciate today or probably anytime soon." Too bad it's $1200. Yamaha could have had a huge hit at the $399 mark. I doubt there is much reason that this is $1200 except that the other boutique option is expensive as well. ok iv'e seen enough uninformative press on this thing. it seems like a lot of people are caught up in the look of this thing. and claims that it's the future with no backing facts is horribly annoying for someone trying to figure out what the excitement is about. all i see is light show. until i see someone making riffs that would be enjoyable by someone listening to the track later at home without the benefit of said light show. i got pulled away from my comment. i'd just like to see a littie oomph and a little less blink and a lot less price. judging by the use in the past i always thought step writers were cost effective. so wait...isnt this just some big corporation ripping off a small american company? can't monome sue them? or were they not the first witht he concept either? I love how people are totally discounting the validity of this product by the fact that they don't see anyone programming it to play prog-rock riffs. Amazing. It's as if some people think that Rick Wakeman is all there is to electronic music. 2) Not that I consider myself the pinnacle of masculinity or manhood, but this this thing strikes me as something a "sweet boy" like BT would parade around on stage to impress his crowds of closet gay nerd ravers. Maybe I'm not comfortable enough with my sexuality to take this on stage. I also wouldn't feel comfortable on stage in a pink leotard either so there you go. 3) You can make the same sounds with Elektroplankton and a Nintendo DS! (Elektroplankton was designed by the same guy who made the Tenori and the bloops and beeps sound damn similar to me.) I actually own it and quite enjoy it. You can get the software AND the DS for way under $200. don't listen to prog or trance sorry. 1 riff is all i ask ifits a better way to get a track going it shouldn't go this long without proving it. i'm plenty minimal. 1) Yamaha has been making designing this thing for many years...don't assume they are ripping off Monome, because you'd be wrong. 2) I'm sorry, but ElektroPlankton and this are two totally different concepts and EP WILL NOT GIVE YOU ALL OF THE SOUNDS this will. 3) $1200 is too much, but $399 for a handmade device is too little. 4) Just as a midi controller, this thing offers more than Elektroplankton could ever. Yeah, I'm well aware of the limitations of Elektroplankton. My comment was meant to be taken wryly with a hint of caustic pessimism. But the stark reality is that your average brainwashed, culture deprived, "Survivor" watching inbred 50 Cent Brittany Spears fan (probably 75% of the people in the US) wouldn't know the difference between the stock sounds of the Tenori vs. Elektroplankton in a blind-fold test. Is the tenori unique and interesting? Yes. Is it "The FUTURE of electronic music"? Not in my opinion. I think the Jazz Mutant Lemur might be closer. Software designers like Cycling 74 and Ableton are probably also close to the mark. I really do have to laugh though when ppl say if it was $399 I'd get one, I would say the components in the thing cost more than that! "I would say the components in the thing cost more than that!" "3) $1200 is too much, but $399 for a handmade device is too little." LOL. A "handmade device"? We are not taliking about the mom and pop shop around the corner or the Monome. We are talking about the multimillion dollar Yamaha Corporation and their factories of automated robotics. Lets not kid ourselves, there will be little "handmade" about it. i'm not whining about the price was just wondering if there was a reason i would want to be caught with a light show toy. obviously not, i guess i'm just jealous. thats exactly it. btw 1200 usd still gets some nice kit. which is why i wouldn't settle for this for the price. I still want one. I'm also surprised that the casing is made of metal. Good show! I'm so sick of cheap plastic instruments. That said, I do think 500 GBP is too much for what it does, but let's just wait for the price to come down, so long as they don't start replacing the aluminum with silver plastic. I can see this being one of those failed ideas that only sells a couple hundred now. Then 25 years from now when the next vintage synth craze hits, all the kids on matrixsynth2030 will talk about how great these rare vintage gems are and they will sell for 17000 space dollars. dollar bin like no groovebox before. I have no idea if the Tenori-On will be cool or not, but it's not really more expensive than a Monome with the same amount of switches. yes its nice that its not plastic. im not so sure if they will sell less quantity. am impresed by the functionality,and design,BUT totaly disapointed to hear it has only a couple of seconds of sampling time,for that price ,and a poor synth engine with few presets for these modern days!! i would like to try one ,but if i buy price most drop,and it will. retention of technology i call that.. I agree that the jury may yet be out on whether this is the future of music -- though it could still be a fascinating new design WITHOUT reaching that absurd goal. But a lot of what is being said here is plain wrong. The Tenori-On did NOT rip off the Monome. Tenori-On prototypes appeared first. 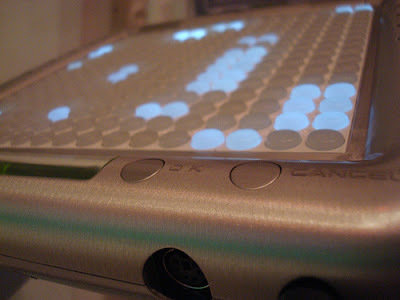 I've talked to Brian about the Monome's creation, and he was unaware of Tenori-On. If you look at the details of how they're implemented, they are very different. I find it interesting that people worked in similar directions, and that the form factor itself is so close, without contact with each other, just because it represents a direction that they found independently. But that happens all the time. Second, no matter how "big" the corporation, doing small manufacturing runs is ALWAYS expensive. Individual components may be mass-produced, but that does nothing about the massive cost of developing products (which is likely LARGER if you're bigger) and custom-machining things like the outer cae. If this is in fact a short run, then Yamaha's costs may well be high. And, in general, the musical instruments industry in its *biggest* runs is far from other mass-produced items in volume. This is not a DIY project. But just be aware, you're making up values with no knowledge of what actually goes into product manufacturing.